Published on Apr 13, 2019 | Filter name: "Abstract Floral"
Usually, I browse through the filter, and if I found something good, I usually browse a few more to prioritize which one I want to review first. After I came across this amazing "Abstract Floral" AR portrait face effect, I didn't need to. I just didn't want to leave this filter and browse forward, I just wanted to experience it right here right now and write a review about it. It usually doesn't happen to me, because there are many great filters to discover. I prioritize those whom I find fascinating the most and I add them to the list of custom filters on this website. This one, I knew from the very beginning that it's going to be reviewed, so why move further. So what makes this Abstract Floral Instagram AR filter so amazing? Well, it's the presentation. beautiful harmony of colors, flowers, abstract color splashes, neat subtle animations and a lovely colorful butterfly that joins that beautiful abstract facial garden. The filter can be viewed with a colored background around your face hiding the camera video stream or without it. I found both to be interesting. The background color helps create a more homogenized visual presentation, but if you have a nice background that you want to be part of the photo or video (especially in videos), you should try it out without the background. The background option could have looked better in my opinion with some nice subtle animation over the solid color. that being said, of course, you have the option to bring your face closer to the camera, so the flora presentation takes more space in the final image or video. You have different color variations, including white, pink, bright yellow and beige. When I tried this mask, I wished that that butterfly would fly from one flower to another, or maybe having a Rufous hummingbird flying from one flower to another with nice floaty flying animation. Maybe having this as an option, something that we can push a button and trigger that animation. The face is colored half yellow half pink which also helps homogenize the entire artistic selfie presentation. 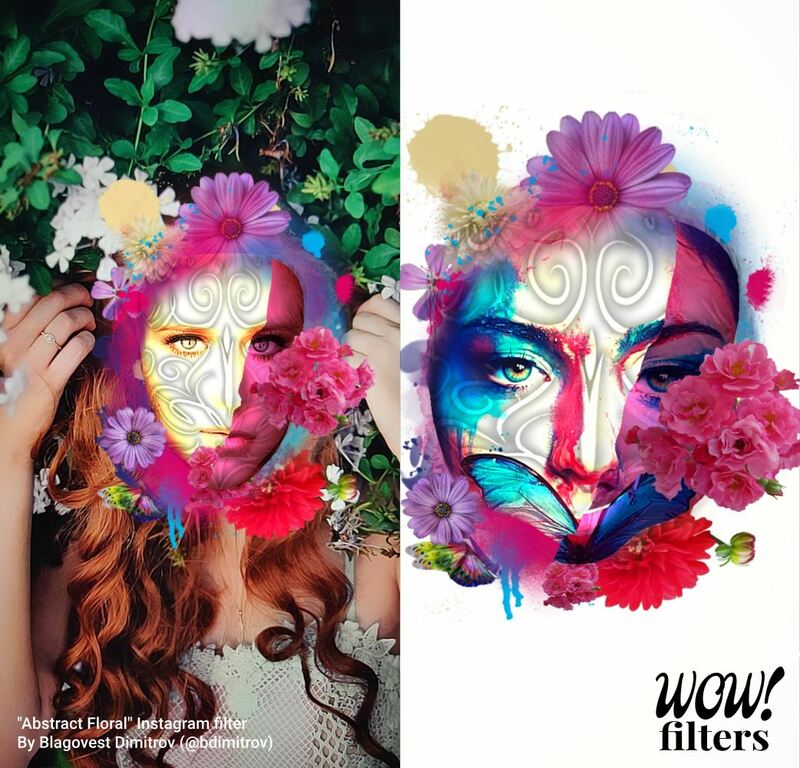 After all, this Instagram filter was designed to use with a face. If a face isn't detected, you won't see the abstract flower graphics because it is pivoted onto the face area itself once detected. Furthermore, you are supposed to be part of the whole artwork. Bdimitrov made sure that your face, no matter how it looks, can blend seamlessly with the abstract floral visuals and create something that looks interesting and unique. The abstract flower art is unique and it looks interesting the way it wraps itself around the face. The flowers themselves are 2D sprites if I am not mistaken, yet the careful positioning of those images in different depths along the z-axis and the animations help create an attractive three-dimensional visual composition. This is actually one of the more intriguing parts of the whole presentation. 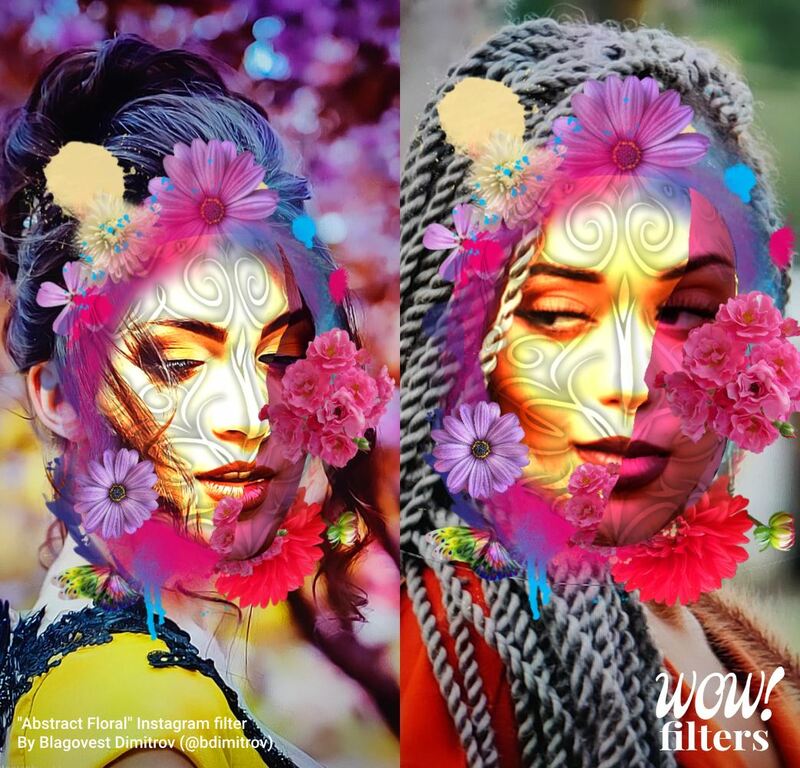 I've seen many filters with flower visuals positioned in various areas on the face as makeup or around the face as a decoration. This "Abstract Floral" does bring something more artistic and captivating. It turns your face into a lovely garden on a bright Spring day. 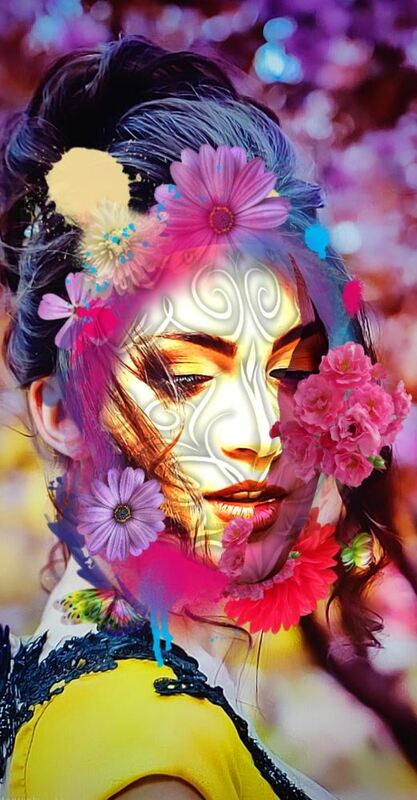 It reminds me of the Flower Face №2 Painting by Oleksandr Balbyshev and I personally can't wait (this is a suggestion) for someone to take this cool floral portrait effect done in Photoshop and turn it into an augmented reality Instagram filter. Overall, lovely and artistic Instagram face mask. It even me look good LOL. Follow Bdimitrov and try it out, it's eye-catching and one that I'm sure many of you will enjoy sharing and other people will enjoy viewing—Thanks for reading. Don't forget to share this review if you like it, This website is nothing without you. Thank you.